Austin-area residents are calling on Archadeck of Austin to build new outdoor living spaces onto their new homes – whether a new home purchase, or completely new home building project. These Leander homeowners had a beautiful new home, but were minus a usable backyard outdoor living area. 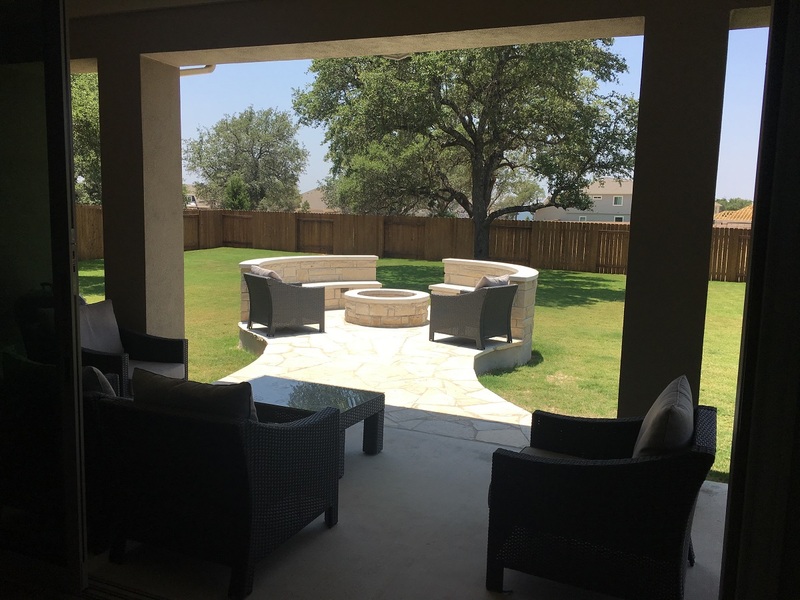 With ample private space out back, they decided that the best use of their yard would be to add a great conversation area with a custom fire pit and a small outdoor kitchen under their patio cover. Archadeck of Austin created this award-winning design. — Custom stone fire pit in Leander, TX. 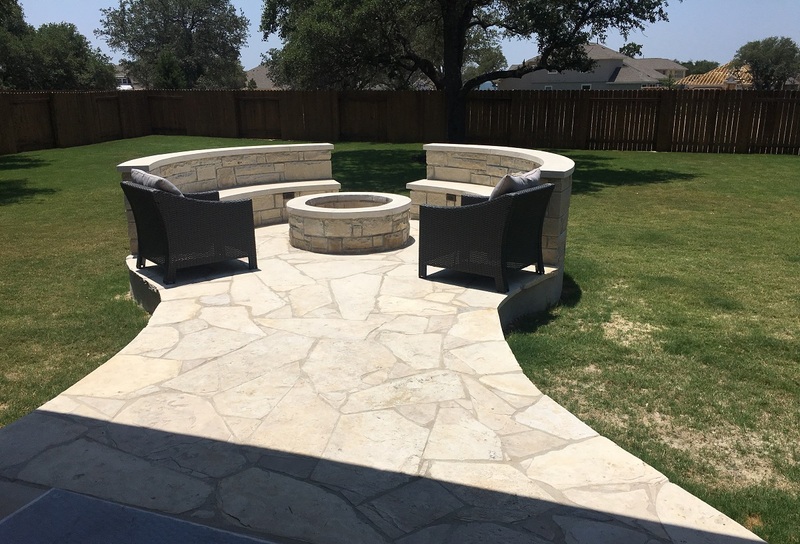 We built a great custom fire pit for these new Leander homeowners with two access points, home and yard-facing. The split design will allow for better access when friends and family are gathering around the fire. The aptly-named rattlesnake gray stone’s light grayish-white hues are a perfect complementary palette to the home’s exterior finishes. The walkway, providing access to the fire pit area, is an ultra-light gray flagstone. — Flagstone walkway leads from the back door to the fire pit. We are your trusted builder for Austin outdoor kitchens. The outdoor kitchen was created with matching stone to that of the fire pit. The kitchen, though small, is a very usable space, which includes a grill area, prep space, refrigerator, sink, and storage. Prep, cooking, and clean-up will be a piece of cake in this handy little outdoor kitchen! 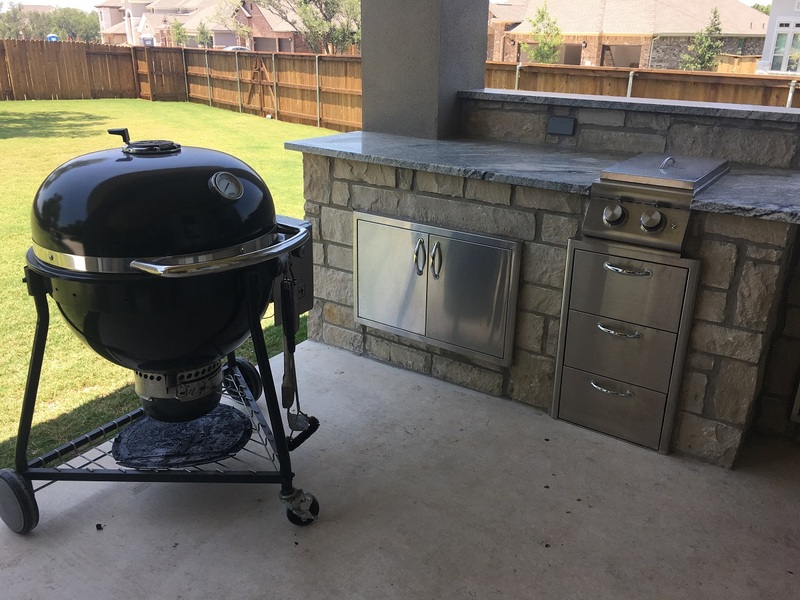 — Outdoor kitchen in Leander, TX. One of the great things about this new Leander home is the large patio window with French doors, which extends 15 linear feet of the back of the home. With the doors open, the patio and fire pit areas become one with the indoor living space – and vice versa – to create a great open-air indoor-outdoor living expanse! — Open doors on the home create a cohesive indoor-outdoor living area! Another design consideration was centering the fire pit area with the view from inside the home. When the homeowners and their guests enter the home, they will see a pleasingly symmetrical placement of the fire pit through the patio windows. 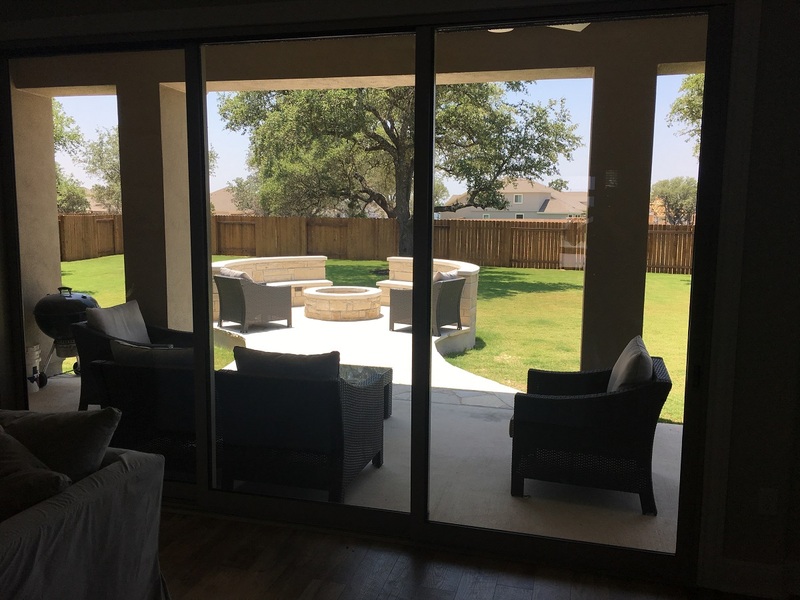 At Archadeck of Austin, we design outdoor living spaces that will be beautifully viewed from inside or outside your home! — The outdoor living area is beautiful – inside or outside! These new homeowners now have a place for entertaining or private living, right outside their back door – with stylish and functional considerations that are the Archadeck of Austin standard. Whether you are building a new home, or have just purchased a new home, we are ready to get you living outdoors with an accompanying outdoor living area, custom-tailored to your needs. 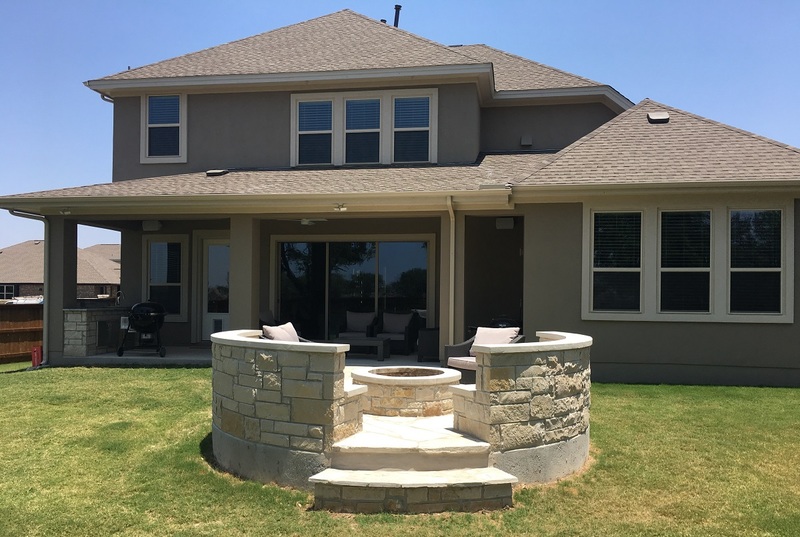 If you are looking for an outdoor living space that will add functionality and beautiful design, call Archadeck of Austin today at 512-259-8282 or email us to schedule your free design consultation.